Another day, another Wal-Mart story. This one is from Businessweek and deals with troubles Wal-Mart is reportedly having getting goods on the shelves (Walmart Faces the Cost of Cost-Cutting: Empty Shelves, Mar 28). 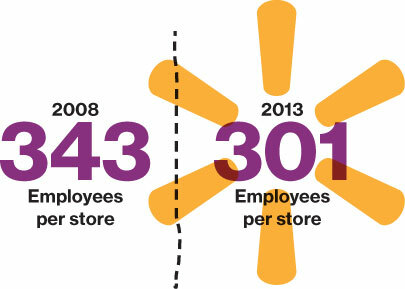 At a Feb. 1 gathering of Walmart managers, U.S. Chief Executive Officer Bill Simon said Walmart was “getting worse” at stocking shelves, according to minutes of the meeting obtained by Bloomberg News. Simon said “self-inflicted wounds” were Walmart’s “biggest risk” and that an executive vice president had been appointed to fix the restocking problem, according to the minutes. Note that this is not a supply chain issue. Rather it is a store operations problem. The goods are getting to the stores; they are just not getting out to the shelves. If you have an Add-on Item in your cart but less than $25 of items shipped by Amazon you can still check out with the rest of your items. When you proceed to checkout we’ll give you the choice either to keep shopping or to check out with the rest of your items and save your Add-on Items for later. We’ll keep your Add-on Items in the “Saved for Later” section of your cart so that you can easily add them to a future order. Just how productive can tweeting be? 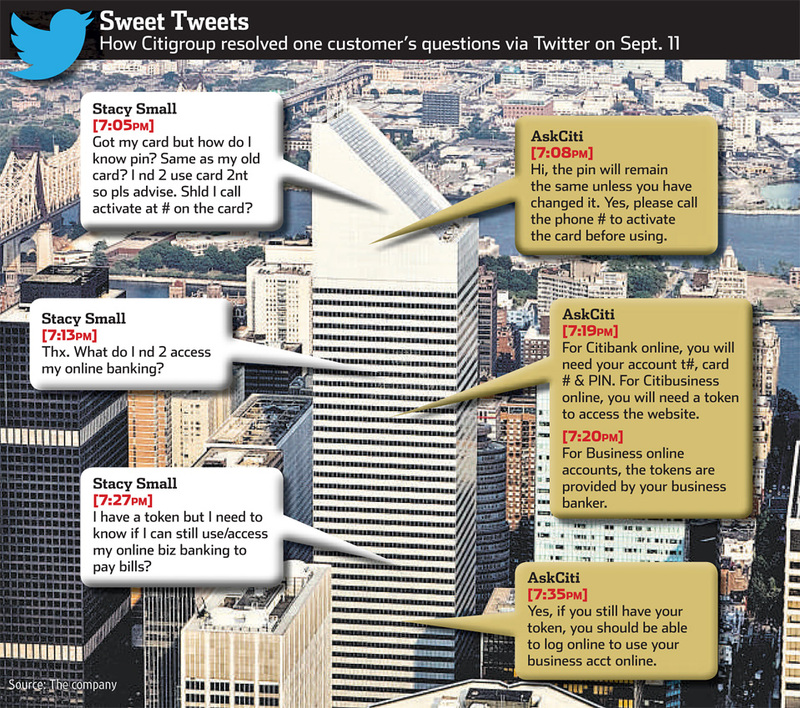 As the Wall Street Journal tells it, Twitter has become an effective platform for customer service at Citibank (Citi Won’t Sleep on Customer Tweets, Oct 4). Frustrated by the 40 minutes she spent on hold with Citibank customer service, Stacy Small tweeted her displeasure. To her surprise, a Citibank agent tweeted right back. “Send us your phone number and we’ll call you right now,” read the message. Ms. Small was the beneficiary of a two-year effort by the Citigroup Inc. unit to overhaul the way it interacts with customers using social-networking sites run by Twitter Inc., Facebook Inc. and others. Through November 22, 2011, American Airlines will offer AAdvantage® elite status members the opportunity to earn a minimum of 500 AAdvantage bonus miles for checking bags on flights departing Boston Logan International Airport (BOS). Earning the bonus miles is easy – simply visit a BOS Self-Service Check-In machine on the day of your departure and follow the normal steps to check-in with bags. Check at least one bag under your own name to earn the bonus miles, which will automatically post to your AAdvantage account five business days after you have completed the travel associated with your itinerary. As a reminder, all AAdvantage elite status members are entitled to check two bags free of charge (within current size and weight limits) in addition to earning the bonus miles with this special offer. Apple’s adventures in retailing have largely been successful. The Wall Street Journal had a recent story that provides some eye-popping numbers on just how well they Jobians have done at the mall (Secrets From Apple’s Genius Bar: Full Loyalty, No Negativity, Jun 15). More people now visit Apple’s 326 stores in a single quarter than the 60 million who visited Walt Disney Co.’s four biggest theme parks last year, according to data from Apple and the Themed Entertainment Association. Apple’s annual retail sales per square foot have soared to $4,406—excluding online sales, according to investment bank Needham & Co. Add in online sales, which include iTunes, and the number jumps to $5,914. That’s far higher than the sales per square foot and online sales of jeweler Tiffany & Co. ($3,070), luxury retailer Coach Inc. ($1,776), and electronics retailer Best Buy Co. ($880), according to estimates. From Belgium, a creative approach to exacting some revenge on a telecom provider with a disappointing customer service record. Reading the subtitles is pretty amusing. Judging by how much the Belgian in the office next to me laughed, the Flemish is just hilarious.